In speculative fiction, floating cities and islands are a common trope, which range from cities and islands that float on water to ones that float in the atmosphere of a planet by scientific or magical means. While very large floating structures have been constructed or proposed in real life, aerial cities and islands remain in the realm of fiction. Seaborne floating islands have been found in literature since Homer's Odyssey, written near the end of the 8th century BC, described the island of Aeolia. They reappear in Pliny the Elder's Natural History of the 1st century AD. In the novel Gulliver's Travels (1726), Jonathan Swift's depicted Laputa, an island city that floated in the sky. Laputa purportedly levitated through use of artificial magnetism. It was primarily a fictional device that was intended to satirize far-fetched pseudo-scientific proposals. During the 1920s, science fiction author Hugo Gernsback speculated about floating cities of the future, suggesting that 10,000 years hence "the city the size of New York will float several miles above the surface of the earth, where the air is cleaner and purer and free from disease carrying bacteria." To stay in the air, "four gigantic generators will shoot earthward electric rays which by reaction with the earth produce the force to keep the city aloft." In 1960, the architects Buckminster Fuller and Shoji Sadao proposed the construction of a 1-mile-diameter (1.6 km) thermal airship, which they called Cloud Nine. This megastructure would be a geodesic sphere that, once it was sufficiently heated by sunlight, would become airborne. Fuller and Sadao envisioned that Cloud Nine would float freely in the Earth's atmosphere, giving residents and passengers a migratory lifestyle. They believed that it might be a partial solution to the depletion of non-renewable resources. The "Triton City" was the work of the Triton Foundation whose principal members were Buckminster Fuller and Shoji Sadao, was commissioned by HUD, a federal agency, by its director, Charles Haar, a Harvard professor, to design a floating city to provide housing in urban areas located near the ocean. A tetrahedron shaped module holding 5,000 inhabitants was designed and a comprehensive engineering report was submitted together with a large model which is on display in the lobby of the Lyndon B. Johnson Center in Austin, Texas. A design similar to Fuller's Cloud Nine might permit habitation in the upper atmosphere of Venus, where at ground level the temperature is too high and the atmospheric pressure too great. As proposed by Geoffrey A. Landis, the easiest planet (other than Earth) to place floating cities at this point would appear to be Venus. Because the thick carbon dioxide atmosphere is 50% denser than air, breathable air (21:79 Oxygen-Nitrogen mixture) is a lifting gas in the dense Venerean atmosphere, with over 60% of the lifting power that helium has on Earth. In effect, a balloon full of human-breathable air would sustain itself and extra weight (such as a colony) in midair. This means that any large structure filled with air would float on the carbon dioxide, with the air's natural buoyancy counteracting the weight of the structure itself. At an altitude of 50 km above the Venerean surface, the environment is the "most Earthlike in the solar system", with a pressure of approximately 1 bar and temperatures in the 0°C-50°C range. Because there is not a significant pressure difference between the inside and the outside of the breathable-air balloon, any rips or tears would cause gases to diffuse at normal atmospheric mixing rates, giving time to repair any such damage. In addition, humans would not require pressurized suits when outside, merely air to breathe and a protection from the acidic rain. Since such colonies would be viable in current Venerean conditions, this allows a dynamic approach to colonization instead of requiring extensive terraforming measures in advance. The main challenge would be using a substance resistant to sulfuric acid to serve as the structure's outer layer; ceramics or metal sulfates could possibly serve in this role. In addition to Venus, floating cities have been proposed in science fiction on several other planets. For example, floating cities might also permit settlement of the outer three gas giants, as the gas giants lack solid surfaces. Jupiter is not promising for habitation due to its high gravity, escape velocity and radiation, but the solar system's other gas giants (Saturn, Uranus, and Neptune) may be more practical. In 1978, the British Interplanetary Society's Project Daedalus envisioned floating factories in the atmospheres of Jupiter refining helium-3 to produce fuel for an interstellar probe. Michael McCollum notes that the "surface" gravity of Saturn (that is, at the visible cloud layer, where the atmospheric pressure is about the same as Earth's) is very close to that of Earth, and in his novel The Clouds of Saturn, he envisioned cities floating in the Saturnian atmosphere, where the buoyancy is provided by envelopes of hydrogen heated by fusion reactors. Uranus and Neptune also have upper atmosphere gravities comparable to Earth's, and even lower escape velocities than Saturn. Cecelia Holland populated Jupiter, Saturn and Uranus with mutant humans, the Styth, in floating cities in her only SF novel, Floating Worlds (1975). Sky Island is a 1912 book by L. Frank Baum with the titular area split between the Kingdom of the Blues and the Pinks. The novel Orion Shall Rise by Poul Anderson features an aerostat city called Skyholm, located above present-day France. The Tangled Lands, a collection of short stories by Paolo Bacigalupi and Tobias S. Buckell, references a lost city called Jhandpara that was once powered by magical means but became consumed by magic-seeking brambles. In the novel The Ringworld Engineers, Louis Wu seeks a way to save the Ringworld by bartering for information in the library of a floating city. Airhaven is a floating city in the Mortal Engines Quartet, that, through attaching gas bags, lifted itself into the air to avoid cities trying to eat it according to Municipal Darwinism. There are numerous floating habitats on the Venus-like planet Chilo in Tobias S. Buckell's novel Sly Mongoose. Buckell credits Geoffrey A. Landis with providing the background information on the floating cities. Saga of Seven Suns by Kevin J. Anderson has giant, manned, gas-mining platforms that mine the hydrogen necessary to, among other things, distill into ekti, a vital stardrive fuel. Charles Stross's novel Saturn's Children begins in a floating city on Venus. Geoffrey A. Landis's novel The Sultan of the Clouds features floating cities in the Venus atmosphere and orbital airships. In Hannu Rajaniemi's novel The Quantum Thief, the Mars colony began as a slave-labor latifundia. After war developed, all entities began taking turns being the beings who kept the city rolling (and deflecting the permanent attack vectors that had been created during the war). The city kept rolling, with everyone's help. The Cities in Flight series by James Blish propose a universe in which cities cast adrift from the Earth, powered by a fictional spindizzy drive. The "War of Powers" series by Robert E. Vardeman and Victor Milan features a Sky City ruled by a race of human overlords called the Sky born who conquered the city from its original reptilian inhabitants. The city is powered by dark magic and floats in a set pattern over 5 surface cities. The mobile floating pirate city-state of Armada in China Miéville's novel The Scar (2002) has accreted in the seas of Bas-Lag from multiple ships and boats over centuries of development. In the 1936 film serial Flash Gordon, Prince Vultan and his winged Hawkmen dwell in Sky City, a metropolis that floats in the sky. Cloud City on the planet Bespin, in the Star Wars film Star Wars: Episode V The Empire Strikes Back. Stratos, on the planet Ardana, in Star Trek episode "The Cloud Minders". In Firefly episode "Trash", the planet Bellerophon is the site of dozens of floating estates with "gracious living, ocean views and state-of-the-art security." Atlantis from the Stargate universe is a probable example of a floating city. Although the city ship weighs several million tons, it is buoyant enough to float on water and, given that its energy shield can hold the atmosphere inside nearly indefinitely, it should be able to float in a particularly dense atmosphere. The Nox of Stargate SG-1 have floating cities. In Avatar, the Hallelujah Mountains are large floating islands that feature as a battlefield in the climax of the film. Metro City in the film Astro Boy is floating above the surface. 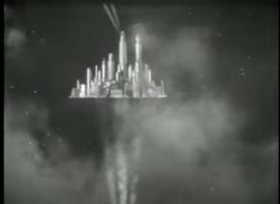 In the film Steamboy, a "Steam Castle" was shown, which was essentially a floating city, kept in the air by means of steam that was directed towards the soil. Hayao Miyazaki's film Laputa: Castle in the Sky involves a floating city hidden in the clouds called "Laputa", a name borrowed from Swift's Gulliver's Travels. In the anime and manga One Piece there are Sky Islands, cities built on a specific type of cloud that has hard, land-like properties, allowing civilizations to have ground to traverse and build on using the same cloud material, along with an ocean-like cloud throughout, making it a close parallel to a normal earthbound island. The unique environment of the Grand Line, an equatorial ocean that circles the globe and possesses all matter of mythical weather patterns, islands and equally mythical sea-behemoths, allows for these Sky Islands to occur regularly - yet are so rarely witnessed even the denizens of the legendary Grand-Line perceive them as a myth. In the 2011 animated TV series ThunderCats, a race of Birdmen live above the clouds in a technological floating city named Avista, powered and suspended in mid-air by the Tech Stone, one of Mumm-Ra's four Power Stones. The animated television show My Little Pony: Friendship Is Magic depicts a city made entirely of clouds called Cloudsdale, a pun on the Clydesdale horse breed. The sky borne metropolis of Caldoria in The Journeyman Project and its remake Pegasus Prime. In Minecraft, an alternate realm from the main game world can be accessed, known as the End. It is composed of islands of white rock floating in a void, populated by gangly ominous-looking humanoid creatures called Endermen. Tales of Symphonia features a floating city named Exire, home to the outcast Half-Elves. Chrono Trigger features the Kingdom of Zeal, a floating island based magical kingdom, encountered in 12000 BC. City in the Sky, the seventh dungeon level of The Legend of Zelda: Twilight Princess. Skyloft, the town in which The Legend of Zelda: Skyward Sword begins. Metroid Prime 3: Corruption features SkyTown, a floating city on planet Elysia. Mother 3 features a floating city named New Pork City which also appears in Super Smash Bros. Brawl. There are several floating cities in the games Skies of Arcadia and Skies of Arcadia Legends. In World of Warcraft, Dalaran is a major city that floats above Crystalsong Forest in the center of Northrend. The setting of the Eclipse Phase role-playing game includes floating cities on Venus and Saturn. Columbia, the setting for the game BioShock Infinite. Sonic the Hedgehog 3 and Sonic Adventure feature Angel Island, an island that floats using the power of the Master Emerald. Vane, the city of magicians of Lunar: Silver Star Harmony. Final Fantasy features the Floating Castle, a floating city that resembles a space station. Final Fantasy V features a floating city named the Ronka Ruins. Final Fantasy XII has several in the form of solid earth islands suspended in the air by mystically charged stones inherent to the earth making up the foundation of the floating city, with Bhujerba being the only one visited and seen firsthand in the game. Sanctuary is the floating hub city of Borderlands 2. Glitzville, from Paper Mario: The Thousand-Year Door, is a small city that floats above Rogueport and its surrounding areas. The RPG Xenogears features a floating city-airship named Solaris. Skyborn is a commercial RPG Maker game which features a floating city. Heart Forth, Alicia is an indie RPG game for the PC which features a floating island, Auster. Xenoblade Chronicles is a science fiction role-playing video game for the Wii which features a floating city, Alcamoth. Tokyo Wakusei Planetokio is a science fiction adventure video game for the Sony PlayStation where the main action takes place in floating cities. Kimino Yusha is a science fiction role-playing video game for the Nintendo DS which features a floating land, Midalias. In RuneScape, each clan is assigned to a floating island built by Armadyl, called a "Clan Fortress". Cave Story is set entirely on a floating island. In LittleBigPlanet 3, Bunkum Lagoon is a floating city in the sky that is located on Planet Bunkum (however, the name suggests that it is located on water and sea creatures feature heavily in this stage of the game). In the eVolo Competition 2012, Wei Zhao describes an island floating in the air using magnets, much akin to the hoverboard featured in the Back to the Future-films. According to Stef Wiegers of the High Field Magnet Laboratory however, the design could never be created as the earth's magnetic field is too weak to support such mass. The webcomic Dresden Codak includes the city of Nephilopolis, a city constructed in the wreckage of a giant floating ancient robot. A flying island appears in the music videos for the Gorillaz songs Feel Good Inc. and El Mañana, where it is shot down by helicopters. It then reappears, partially repaired, in the music video for the song DoYaThing. ^ Homer (2008) [8th century BC]. "10.1". In Shewring, Walter (ed.). The Odyssey. ^ Fuller, Buckminster; Kiyoshi Kuromiya (1981). Critical Path. St. Martin's Griffin. ISBN 0-312-17491-8. ^ Landis, Geoffrey A. (Feb 2–6, 2003). "Colonization of Venus". Conference on Human Space Exploration, Space Technology & Applications International Forum, Albuquerque NM. ^ Atkinson, Nancy (July 16, 2008). "Colonizing Venus With Floating Cities". Universe Today. Retrieved 2008-09-23. ^ Landis, quoted in Atkinson op. cit. ^ Seif, A. (1985). "Thermal Structure of the Atmosphere of Venus". In Hunten et al.,, D. M. (ed.). Venus. Tucson, AZ: University of Arizona Press. pp. 215–279. ^ Buckell, Tobias, "The Big Idea: Tobias Buckell" interview in Whatever, Aug. 19, 2008 (Retrieved on 2008-09-23). ^ "Star Wars Databank: Cloud City". StarWars.com. Lucasfilm. Retrieved 21 April 2017.